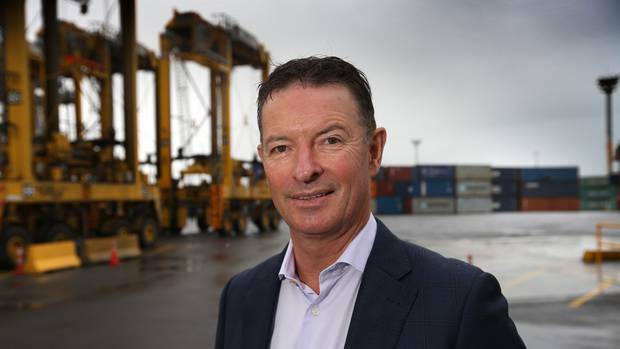 Ports of Auckland reported a 27 per cent lift in net profit, boosted by some one-off gains and a full year of revenue from its Nexus Logistics and Conlinxx units. Reported net profit for the year to June 30 was $76.8 million, up from $60.3m the year before. But that included $17.6m for items related to asset valuation changes and impairments, compared to $5.3m in the 2017 year. 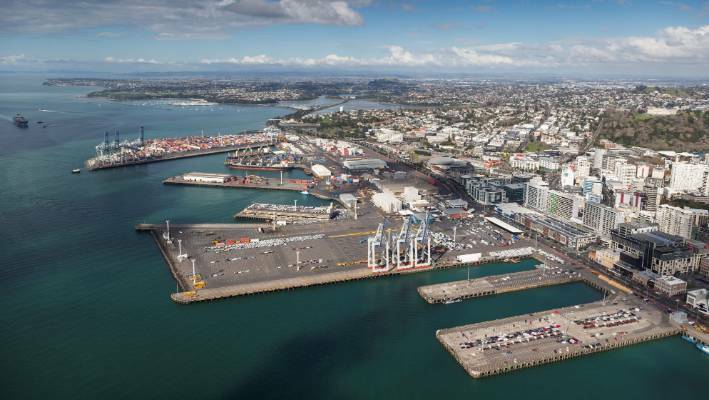 Ports of Auckland will pay a dividend of $51.1m to the Auckland Council, slightly down from $51.3m the year before. Group revenue was $243.2m, up $20.8m. Freight volumes increased and the port benefited from buying out its joint venture partner in Nexus Logistics in May 2017. That brought Conlinxx, which manages Ports of Auckland’s Wiri inland port, back under its control. The country’s largest port said that container volumes were up 2.2 per cent to the equivalent of 973,722 twenty-foot units, while breakbulk and bulk volumes were up 4.8 per cent to 6.77 million tonnes. 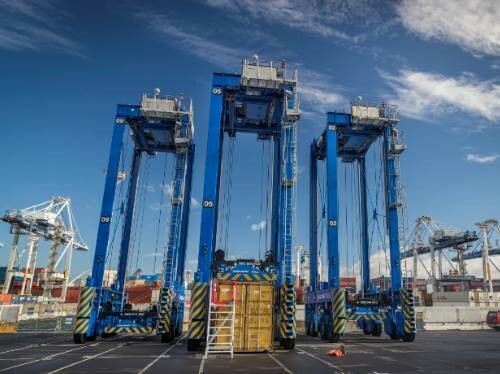 The container terminal team delivered an average crane rate of 35.63 moves an hour this year, nearly one move per hour more than in the previous year. The company said significant progress has been made on the automation of its container terminal, due to go live in the second half of the 2019 calendar year. It has also completed earth works at the Waikato Freight Hub and started construction of the first freight handling facility for Open Country Dairy. Road and rail connections will be built during the next 12 months and the hub will open for business by mid-2019, it said. As a result, capital expenditure was $130.5m, versus $88.2m in the year to June 2016. Looking ahead, chair Liz Coutts said the risks to the trading environment are similar to last year. Container shipping lines continue to consolidate, with the top 10 lines globally now accounting for 80 per cent of all container traffic. In New Zealand, the largest line has captured around 50 per cent of the market and the number of container lines calling at Ports of Auckland is down to eight as a result of mergers and acquisitions. “We face relentless pressure to increase efficiency and cut costs,” she said. Coutts said the company is also mindful of the potential threat to the global economy from the rise of protectionism and a possible trade war. Any global economic slowdown that resulted would probably affect New Zealand and reduce global shipping volumes. However, “the company is in a good position to weather such an event,” she said. Construction has started on a major new freight transport hub in Horotiu, north of Hamilton. Open Country Dairy, New Zealand’s second largest exporter of whole milk power, will be the first tenant at the port and their facility will be up and running by early 2019. 51 Horotiu Road may look like one big paddock right now, but it is set to be an inland port in the Waikato owned by the Ports of Auckland. Reinhold Goeschl, general manager of supply chain, estimates in five years there will be 300 people working within the hub. Open Country Dairy (OCD) was the first to sign up. They’ll use one of the warehouses, while the others are yet to be snapped up. Containers will arrive at the hub full of imported goods to be distributed around the region. Once emptied, OCD will instantly refill those containers with exports like milk powder to be sent straight back. 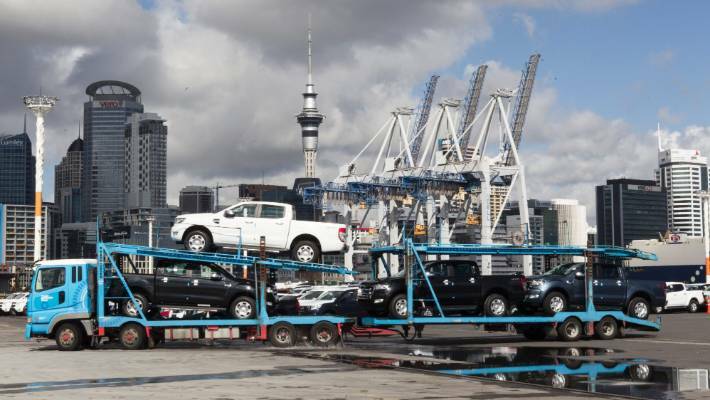 Ports of Auckland CEO Tony Gibson says it’s taking a cost out of the supply chain. The inland port is right in the heart of what’s known as the golden triangle, and with the expressway and railways both nearby, moving freight to the three points of that triangle – Hamilton, Auckland and Tauranga – becomes very easy. But they’ve got some competition just down the road. The Ruakura Inland Port is also under development. Coming in at just 33 hectares, it has nothing on the OCD’s 480 hectares. Mr Gibson has dismissed the idea of competition. Both ports are intended to boost jobs, infrastructure and business in the area. Waikato District Mayor Allan Sanson says the more the merrier. 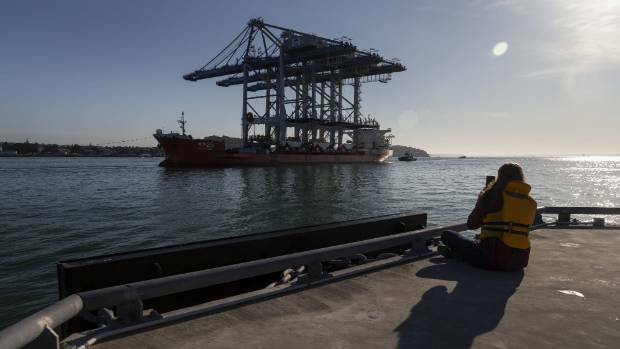 Auckland’s port has just become home to the largest cranes in Australasia. 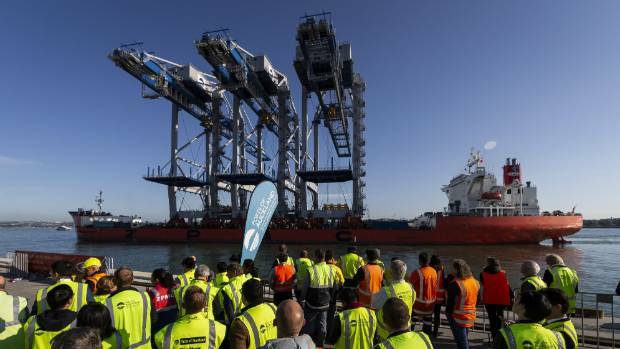 Three massive container-lifting cranes, each one larger than central Auckland’s HSBC building, completed the final leg of their month long journey from Shanghai, China, to Auckland on Friday morning. The special delivery was the culmination of 20 years worth of preparation, and a $60 million investment. The cranes, which stood 82.3 metres tall and weighed 2100 tonnes each, docked at Ports of Auckland in Mechanics Bay after 9am. From there they will be offloaded onto the Ferguson North Wharf using specially designed rail tracks. 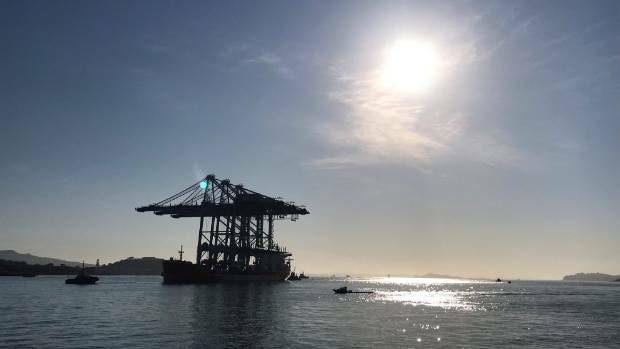 Three gigantic cranes arrived in the Auckland harbour on Friday morning. 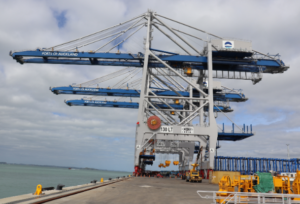 Ports of Auckland boss Tony Gibson said they were the most technically advanced cranes on the market. He said the cranes’ capacity would greatly increase of the port’s ability to load and unload ships. The cranes stand 82 metres tall and weigh 2100 tonnes – each one larger than central Auckland’s HSBC building. The cranes were manufactured by Chinese multinational engineering company ZPMC, especially for Auckland’s port. They could stack containers on ships 9 high. 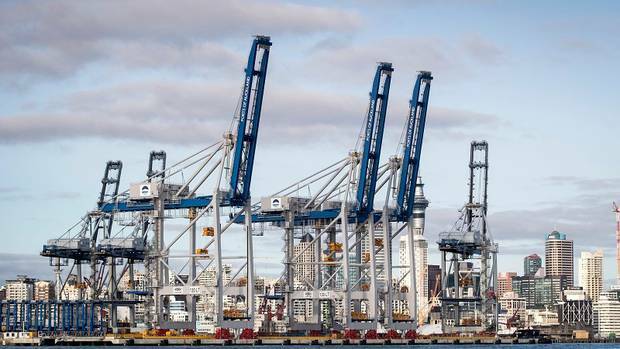 New Zealand’s current largest cranes can stack containers only 7 high. Auckland mayor Phil Goff said with such precious cargo, it was lucky the ship had not passed through a typhoon. He said the upgrade was good for Ports of Auckland, and therefore a “bonus” for the ratepayers. Ports of Auckland workers, standing on the decks of the old cranes, lined up for an unobstructed view of the new Chinese imports. 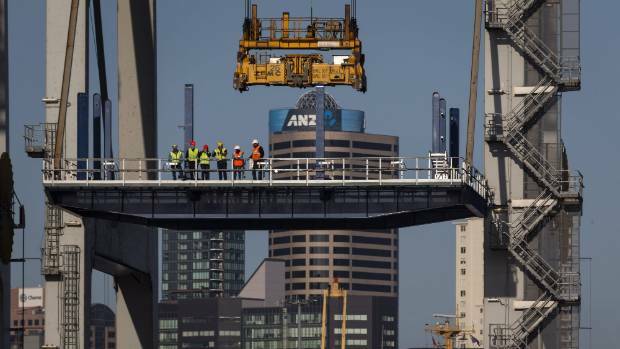 Port’s spokesman Matt Ball said the cranes were needed to keep up with Auckland’s growth. “More people in the city means more freight. The ships that bring our goods from overseas are getting bigger, so we need to make sure we can handle them. The new cranes will work at double the capacity of the current ones. – 82.3m tall, current cranes are 69.2m. – 2100 tonnes, current cranes are 1300 tonnes. – Able to lift four containers at once, current cranes can lift two. – Able to be remotely operated – a New Zealand first. – Able to lift containers stacked at different heights. 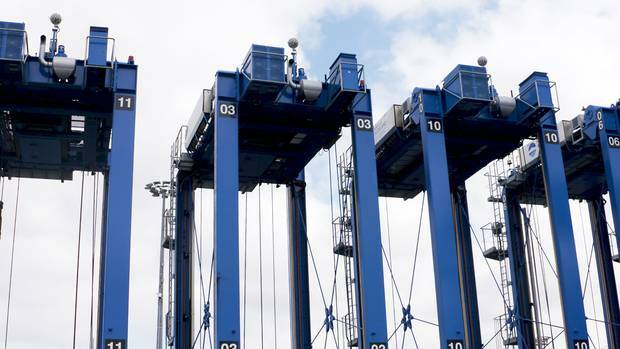 – Can reach 21 containers across, current cranes can reach 19 across. SHANGHAI, Sept. 24 (Xinhua) — The container transport capacity of Shanghai International Port, currently the busiest container port in the world, has surged more than 5,000 times since China began implementing the reform and opening-up policy in 1978. The figure represents an annual average growth of more than 24 percent, making the company the world’s largest port in terms of container capacity for eight consecutive years, the data showed. Chen Xuyuan, the company’s chairman, attributed the rapid rise partly to the country’s fast growth and steady world economic growth over the past 40 years. China’s GDP rose 33.5 times from 1978 to 2017, with an average annual growth of 9.5 percent, much higher than the world average of about 2.9 percent during the same period. The company’s half-year report filed with the Shanghai stock exchange showed that its throughput in the first half rose 4.6 percent to 20.50 million TEUs, continuing to be the world’s largest.